Well, if your success has made you think about your future growth and reconsider your e-commerce platform, you are not alone. You are just preparing yourself for re-platforming. The shift from a small business to a bigger, more complex one often necessitates changes and it is time for you to strengthen and upgrade the core that is supporting your success. Usually, business owners keep ignoring the initial signals of an inefficient platform. Issues like slow site speed, broken checkouts, high maintenance costs and lots of manual overhead to complete everyday processes are brushed aside initially. However, things become serious when you encounter site-crash for the first time and it becomes alarming when the nightmare happens again and again. This is when you can read DISASTER blinking everywhere! E-commerce Platform Migration: When is the Right Time to Move? If you have not yet reached the alarming level but suspect this might eventually happen to your business, this is the right time to consider an upgraded technical solution for your business. If you are even considering this it means you might enter that phase anytime when your technical glitches send your sales spiralling down. You certainly should not take this RISK. It doesn’t matter if your business is new or if you have spent considerable time in the market. While launching their first online store, entrepreneurs usually look for basic features and an affordable pricing model. During the initial phases of business, even basic feature suffice for your business. However, as your business grows such platforms that are based on the principle of one-size-fits-all start hurting your business. Basic e-commerce solution providers lack variety and diversity in features. You might face major challenges in implementing essential features like multi-level product categories, adding multiple payment channels or improving the overall site design for better navigation and search. Also, if the technology is not future ready and designed/updated keeping the emerging e-commerce trends, you might very soon feel the need to move on to a better platform that gives you a technological edge. Outdated platforms can impede your development by making it difficult for you to provide a seamless shopping experience based on personalised customer needs. If you are already facing these issues, it’s time you start planning your e-commerce re-platforming. Majority of online stores need some basic features to run the show. Based on this premise the e-commerce website builders also use the one-size-fits-all approach and design a platform that is suitable for most SMEs. The solution also works considerably well when the online stores are in their initial stages. However, as the business scales, new product lines are added, new teams are added, new flows need to be worked out and you also need to find new sales channels. This is when start feeling the need for a more well rounded and expansive e-commerce platform. Imagine a scenario where your products are in great demand and you want to explore the opportunity of selling on popular marketplaces like Amazon, Flipkart etc. If your platform does not offer marketplace integrations and proper tools to manage the inventory on the marketplace as well as on your storefront the whole exercise might become too cumbersome. Also, you might end up purchasing different third-party apps to work this setting resulting in complex integrations and syncing of different apps developed by individual third-party providers. There could be numerous such scenarios where a rigid platform becomes a bottleneck. If you are in the middle of such a scenario its time to give a serious thought to e-commerce re-platforming. Does it take too many manual steps for your teams to receive and process the orders received on daily basis? Do you need a large support team to follow up on order confirmation, delivery tracking etc with your customers? Does uploading a new set of products to your site takes hours? If you are answering YES to these questions you certainly are not using an advanced e-commerce solution provider. If the workflows on your online store are not supported by automatic processes that require minimal or no manual intervention, it could be very cumbersome to handle the day to day operations. You would need a much bigger team and chances of human error might also go up substantially. On the other hand, if you have support for automating follow-up emails, bulk export and import of products, automatic inventory update, easy to set and use discounts and coupons, taxes, commissions for various vendors, automated shipping etc. managing your operations becomes much faster and simpler. If the above seems unbelievable to you, you need to explore StoreHippo e-commerce platform that offers all these and many other features for reducing manual effort. Imagine a scenario where you need to give personalized deals to your customers in real time using notifications. Or maybe go for some aggressive marketing using various social channels, drip email campaigns, a specific marketing page that becomes the landing page for your campaign? And yes you also need to interpret and analyse all the results? How do you think you can achieve this all? This complex flow can be achieved if your e-commerce solution provider allows for easy integrations with various third-party tools for managing your marketing, finances and analytics. Also, as your business grows you might need a more sophisticated helpdesk, financial solutions and multi-channel payments integrations. A well-rounded e-commerce solution should offer well-amalgamated integrations with a variety of tools so you can have smoother processes despite the complexity. This becomes even more pronounced for an enterprise or B2B business that have unique flows and need B2C as well as unique B2B functionalities to complete everyday operations. If you are also finding it difficult to integrate efficient systems to your portal, its time you started planning for e-commerce re-platforming. As you create a name for your brand in the market and start growing steadily, it becomes imperative that you start exploring new flows, business channels, new geographies and new strategies for your growth. All these combined necessitate certain changes to your basic operations along with the processes involved. To support your new plans for growth and expansion you need a better and more exhaustive technologically advanced e-commerce system that not only provides support for a cart but offers features like a multi-vendor marketplace, multi-store functionality, multilingual website, B2B functionalities and other tools needed for global e-commerce. If you are noticing that your e-commerce solution provider is not able to provide these features needed for your growth and expansion, it clearly means it is the time to consider migration and start evaluating new platforms that can give you a better solution for your growing business. The ideal time to move and re-platform your business is before the situation goes out of hand and forces you to take disaster control measures. You definitely don’t want to offer your customers to your competitors on a platter by leaving them frustrated over your site performance issues. Moving from an existing e-commerce solution provider to a new one might seem like a risky and time-consuming process, but you need to take a decision when you start seeing the visible signs mentioned above. 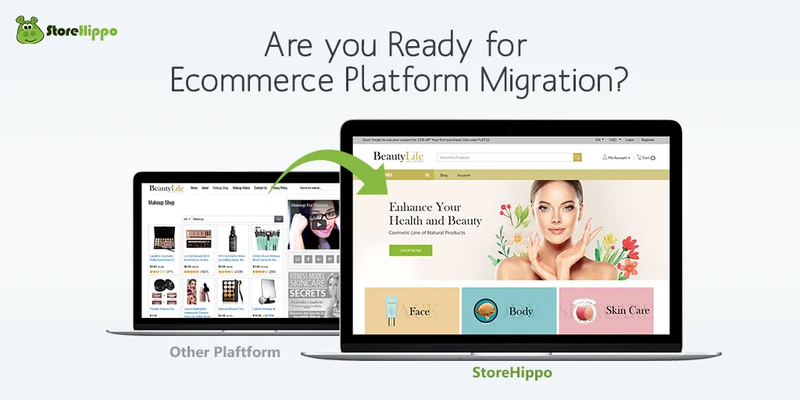 StoreHippo offers a comprehensive e-commerce solution for every size and type of online business. The well-rounded platform is built in a way that it accommodates your growth and allows you to move from one plan to the other as your business scales. Interested in knowing more? Book a demo and explore the easy migration process with StoreHippo our team.